Background: Does the term 'Land Speed Record' ring a bell? Ever since the early 1900s humans have tried to break the speed records with custom build cars. The earliest attempts were raced on the sands of places like Daytona Beach, but when the cars got faster the racers exchanged the soft underground of the beaches for the much better salt flats and dried up deserts. The Bonneville Salt Flats is one of those places where speed records have been broken. Usually, the speed monsters were given a name: 'The Green Monster', 'Spirit of America', 'Bluebird' and many more. Traditionally, France and Belgian drivers competed for the record in the early years, but since 1914 it were the British and Americans who competed for the record. 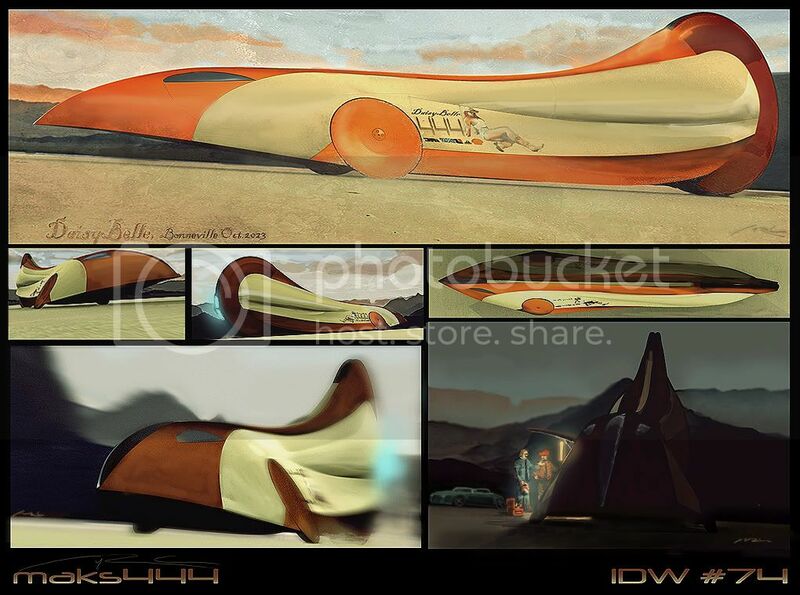 For this weeks topic, you have to come up with a land speed record breaking machine that goes by the name "Daisy Belle". The rules for this record state that it has to have wheels, but may not ride on a pre-build track. Also, there are different categories (piston engine, turbine engine, electrical car, motorcycle, etc) so you are free to chose any of these categories as long as it is a land speed record racer. Mind also the timeframe for your racer. You are free to design a racemonster from the 1930's or one from 2080, it's up to you. 1. 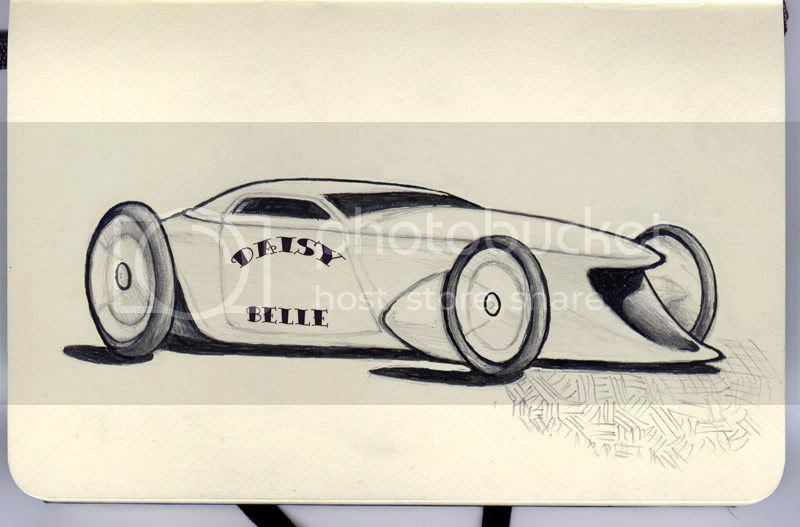 Design and draw the "Daisy Belle", a Land Speed Record breaking monster! but i gotsta miss it :'( going to spain. here's an early version of my vehicle. I think i want to redesign the back portion and expose some of the innner workings of the thrusters. Great topic, hope I finish this. A quick sketch between other stuff today. I started with a 34 ford and went a little crazy. i was working so hard in the last few hours i had to hand today to get something finished, but i just don't have time to get it polished up to a good enough standard. 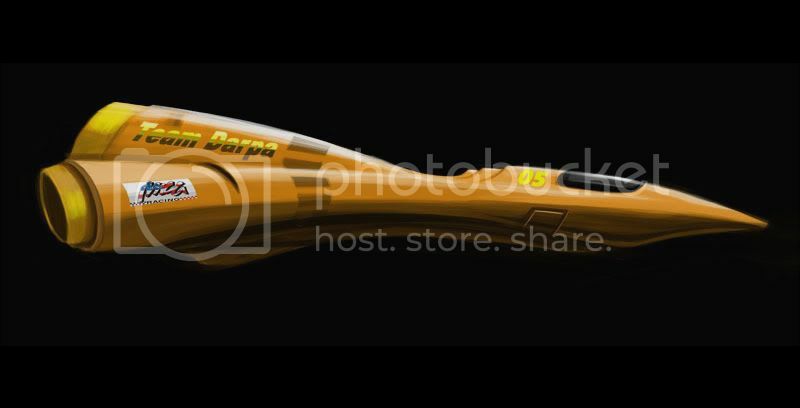 Will share anyway, but understand if it falls below the bar as the render simply hasnt had any time (at all) put into it. will be killed if i dont leavbe the house right now! Not exactly as finished as I would have liked but I'm going out of town first thing in the morning so I rushed to get something done. I hope to be home in time Sunday to post in the voting thread. She's basically a retro style lake speedster with some modern styling and engineering twists. The large intake where the grille should be feeds a pair of Bell turbine engines (hence her name "Daisy Belle") that would be more at home in a Helicopter. Her death defying owner/driver Travis "Crash" Lewis pilots her from the aptly named HOT seat squeezed between the two engines and directly behind the fuel tank. When asked about the danger in piloting such a potentially deadly craft Lewis jokingly responded. "Well if I ever do push her to far and and crash, at least I'll be the first one at the scene." Lewis expects that on her maiden voyage next week she will set a new class record of over 550 MPH. Last edited by lewisaurus; August 16th, 2008 at 07:46 AM. The "Daisy Belle" named after the most famous cow in glorious Kazakhstan seconds before it smashes the land speed record in 2075.
all wheels have an extreme negative camber, in the front the angle helps making the wheel a part of the aerodynamics, at a certain speed the front wheels act more like wing flaps then actual wheels, the huge back wheels have more centrifugal force then small wheels providing a lot of stability, they have less camber but still enough to allow the top of the wheel to almost touch while leaving enough room at the botom for the turbine exhaust. All this in hopes of the widest track possible with the best air flow all around. my last post was my final ...i was'nt sure it was very clear before. Vibhas Virwani: Look out with the perspective. Especially the wheels are off, as they on one horizontal line while on the rest of the vehicle you try to show the top of the vehicle too (like on the nose). 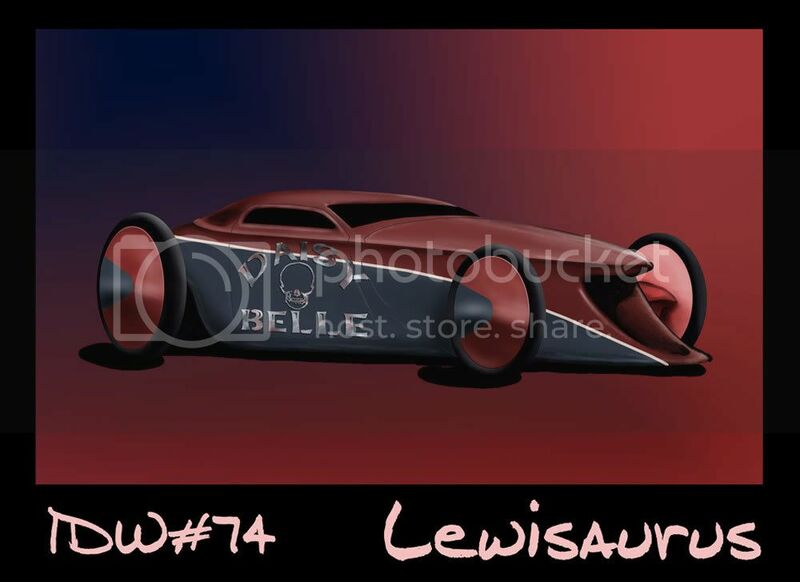 Designwise, the whole is a bit of a mumbo jumbo of shapes and details. 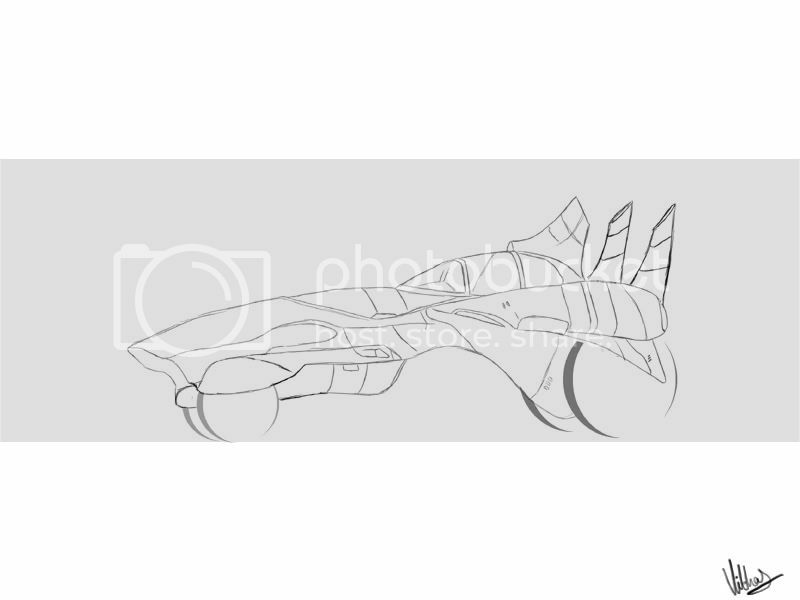 Try to figure out what the main shape of the vehicle is -in this case I'd go for something a bit more streamlined and plain- and add details later on. If you're manage to make it on time, play around with the canvas size too. There's a lot of unused white space all around the vehicle at the moment. Anyway, I'll let this round run for another..let's make it a bit less than 24 hours from now. Last edited by vibhas_virwani; August 19th, 2008 at 02:14 AM. Time to close this round I guess poll will be up in a minute. Razorbjc: As you were early with posting a WIP, I'd hoped you would find the time to finish something. Promising start, though I seems the front part is seen in sideview while the back is partly seen from above. The exhausts seem to point at weird angles. Overall it could have been more sharper and more rendered. XXITheWorld: Unfortunately there is little critique on yet. One suggestion I have however is that you focus a bit more on the design itself rather than the background. Especially in a challenge like this Industrial Design of the Week activity, I'd rather have a nice design without a background than a mediocre design with lots of stuff going on in the background. Mind your ellipses too, the wheel at the back is more of a blob. Check pictures of cars and suchlike to find out what it should look like (or check out my mentor thread, though I hate self promotion this way ). 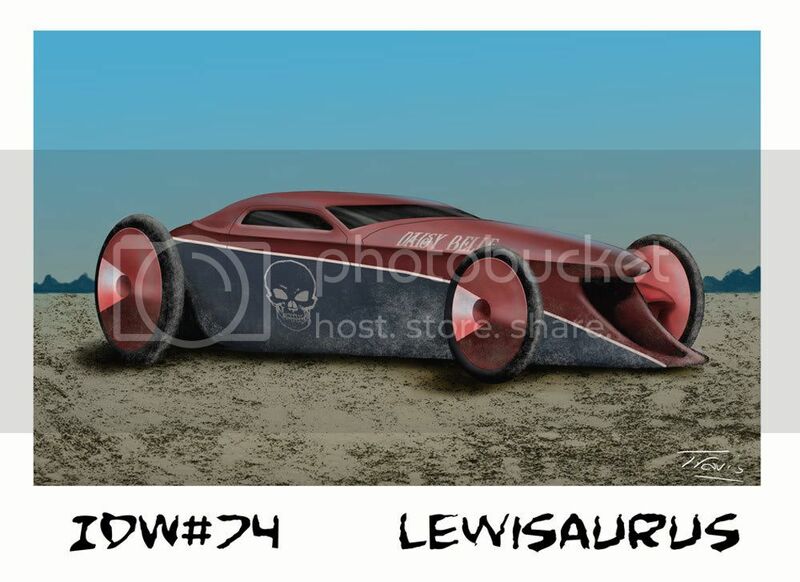 Maieth: Shame you didn't get the time to finish this one, the initial sketch reminded me very much of the Nuna (solar powered car from my university for the Australian race). Mugen1: First of all, please use the attachment manager of CA next time. A small image like that gets overlooked very easily I'm afraid. Just click on the 'Go Advanced' button when making a new post, and at the bottom of the page there is an option to add an attachment to your post. Great start, though it looks a bit heavy. If you'd added more details and texture it'd have made it to poll. I think my major crit would be that it simply doesn't look like a finished render at the moment. Xezor1324: Like most of the above crits, your entry simply didn't look finished enough to make it to poll. Apart from that however, designwise it simply didn't really fit with the topic. The wings, wheel that's almost not visible and slapped on rocket engine it looks more like a WW1 fighterplane than a speed record breaking monster. Also, the rivetted on metal plates only make it look heavier rather than fast. Next time spend a bit more time on the desing, maybe do some research on the topic to see what works and what doesn't. MNitschke: Good start, just a little too late to finish before I was going to put up the poll I'm afraid Little to say here actually, partly because it's still in its very early stages. Designwise I think the huge wheels and the groundclearance make it more of an all-terrain vehicle than a speedy car. Fast cars are usually very close to the ground. Hope this helps you all a bit. I'm not trying to discourage anyone, rather the opposite actually Feel free to PM me if you don't agree with me here or have questions. Last edited by yoitisi; August 20th, 2008 at 06:57 AM. "Body Shots"... sans tequila, salt and lemons.